Gulf Consult were engaged by the Ministry of Health to undertake the Concept Design for the new Al Razi Hospital. 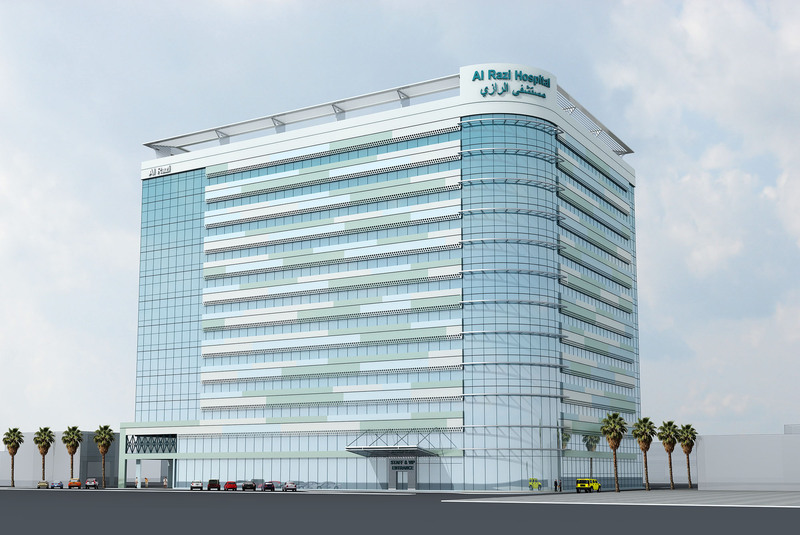 This new Al Razi Hospital is proposed as an addition to the existing Al Razi Hospital within the Al Sabah Hospital Campus in Shuwaikh, Kuwait. This addition will be an Orthopedic Hospital with all new state of the art facilities within a multistorey 12 floor building and will include 240 beds. The site allocated for the hospital expansion adjoins the existing hospital and is a 2,913 m2 L-shaped plot, approximately 50 m from Jamal Abdul Nasser street. The new extension comprises of mainly physiotherapy and radiology department with 10 floors of inpatient wards. The basement is allocated for future expansion. The total built up area is 33,410 m2 including the central plant and medical gas building structures. The conceptual planning is generally based on providing defined circulation routes for patients, visitors, materials and waste.